U.S. Fish and Wildlife misses deadline on jaguar recovery plan Utah Senate Bill calls for removal of all wolves that may enter the state. Preliminary wolf mortality numbers from the Idaho Fish and Game released. Officially, a total of 273 wolves died in Idaho from all causes. 260 were human caused mortalities which is up 120 from last year resulting in a 178% increase in overall mortality. From September 1 through December 31, 135 wolves were legally harvested. During this period three wolves were documented to have been either shot illegally or wounded and not retrieved, another was killed in a closed area, and a fifth wolf was accidentally killed in a snare legally set by a trapper. These wolves were all counted against the harvest limit for the zone in which they were killed. The heaviest harvest occurred October 10-12 when 16 wolves were taken by hunters over the three-day weekend when deer season opened in most of the state. Hunters harvested 21 wolves in December. 94 packs present in Idaho at the end of December. Reproduction was confirmed in 62 packs, and 50 packs are believed to meet Breeding Pair criteria (at least two pups produced and currently surviving). Biologists documented 15 new packs during 2009. Three packs were eliminated by control actions to address livestock depredations, and five previously documented packs were dropped from the count because of a lack of confirmed activity during the year. Your comments imply that somehow the money used for Idaho wolf managment or any Idaho wildlife management for that matter, could be at the expense of state government obligations that rely on general funds. General funds are those moneys generated by the state tax code and other traditional funding sources. The IDFG (and it’s programs) is entirely funded by a combination of user fees (hunting/fishing license, tag and permit receipts), matching federal D-J and P-R excised tax money specifically dedicated to state fish and wildlife conservation programs and federal mitigation accounts specifically dedicated to mitigating the impacts of hydropower and other federal projects on public wildlife resources. This mischaracterization of wildlife management funding has been corrected several times in recent months. This funding formula is an elementary and fundamental fact of our North American Model – i.e. wildlife managment – in each of the 50 states. DNA analysis is now a basic component of modern wildlife management science. It is central to our understanding of population viability, enforcement of wildlife conservation laws and our understanding of how wildlife populations interact with each other and their environment. Maintaining the scientific strength and credentials our wildlife managment programs, with DNA analysis, has nothing to do with funding state education, feeding the hungry or any other essential state social obligation. I’ll be happy to answer any questions you might have about state wildlife management funding. Sorry, I confused you with grace. Just a point of clarification: your comments seem to imply that all funding for wildlife management agencies come from (a) the sale of hunting and fishing licenses, and (b) PR/DJ funds. I don’t think that was your intent? Missouri, for example, funds wildlife conservation (in part) through a sales tax and other states have and do tap general funds. Here is a question for you. Do you think the hunters and fishermen and fisherwomen…~S~..would give up the extra pull they have with the agency because of their fund importance if a general tax supporting all FG programs were passed? I have always been in favor of all citizens of a state paying their fair share, and it wouldn’t add but a penny or two to the general tax rates so the average citizen wouldn’t really feel it at all. Or is that traditional power and extra access those groups have worth it to them so that FG budget are always marginal and programs struggle to get adequate funding? Thanks, good catch. Yes, I should have used Missouri, and Arkansas, as examples of broader funding bases than we have in Idaho. The IDFG has advocated a broadened funding base for years. The funding model that Missouri and Arkansas have adopted is one alternative that would more responsibly and effectively fund all of our wildlife conservation programs, especiall our non-game programs. Jim/Mark: I hope my comment didn’t come off as uncivil? I should really avoid all attempts at humor, as it is so often misconstrued. I sincerely hope that IDF&G (and other wildlife management agencies) are successful in broadening funding sources in the future. With declining participation in hunting and fishing in many states and increases in “legacy” costs associated with retirements, the North American Model of scientifically-informed wildlife management is truly threatened. I would like to see an excise tax (equivalent to PR/DJ) placed on bird feed/feeders, field glasses, and other outdoor gear commonly used by non-consumptive users of wildlife. I know this has been proposed (and killed) in the past, but I think we (conservationists) need to continue to push for this type of funding. No apology necessary. This is a rough and tumble forum. Your comments are always within the bounds of civility. Good question. I believe there would be much concern by the traditional hunting/fishing community if wildlife management were to be funded entirely (in some cases even partly) by state general funds. I doubt that any state agencies would support more than augmentation of traditional funding sources to support wildlife management. There are very good reasons that everyone should support a user fee model for wildlife management – consumptive and non-consumptive users together. The traditional funding formula provides a layer of insulation (not armor) between the political process and essential year to year wildlife conservation and management funding needs. Nothing in human endeavors is divorced of political realities, but in terms of funding – the cat fights that we see annually for funding of education and health care would always make wildlife conservation/management a distant, lower priority. JB is right. Our discussions over the years with state leadership regarding alternative funding sources, such as a small percentage of state general tax revenues or a very samll percentage of the state sales tax – have gone no-where. If we were largely dependent on general revenue for funding wildlife conservation and managment we would always be competing for increasingly limited general funds in a time of our history when the societal needs for those funding resources are increasing at a near exponential rate (baby boomer generation stresses on SSI, Medicare/Medicaide, public eduction, transportaton infrastructure, etc. ect. ect…….). This is one of the biggest challenges to state wildlife mangement agencies in the present and near future. A VERY imortant topic that we should be able to find common ground for across the spectrum of wildlife advocacies. Raise the cost of resident hunting and fishing licenses, which are way below value. A ski lift ticket or a round of golf cost more than a elk, deer, bird hunting and fishing license. I pay $73 in Montana for a sportmans license which includes all of the above and $78 for a day of skiing at Big Sky. Golf is just not my bag but I here that it is up to $50 on a public course. A UM vs MSU football ticket is near $50 for 3 1/2 hours of play. Raise them. Here’s an interesting question: at what point would an increase in individual license fees reach a critical level beyond which poaching would significantly increase? Has anyone ever pursued such a study? Robert: Interesting idea; I don’t know of anyone who has pursued this. My problem with increasing hunting fees is that you essentially force meat hunters out. One pillar of the NA model is the idea of equality of access to game/wildlife; that is, while hunting was a past time for the privileged aristocracy (a right of birth) in England, in North America it was open to all people. Increasing fees, while probably justified, recreates a “privileged” class by putting hunting out of reach (financially) for some people. Another issue is that, under the public trust doctrine, states should be managing wildlife for ALL of their citizens. Management should not be geared toward the benefit of one specific group, nor should this group be required to pay all of the associated costs. It is simply an issue of fairness. These are all important questions and points. It will be very difficult to adequately fund the breadth of needed fish and wildlife conservation programs by traditional state funding formulas alone. The demographics of hunting and fishing participation, the cost of doing buisiness, the increasing challenges to wildlife management agencies make traditional hunting/fishing generated revenue inadequate to meet those total needs. JB, you are very correct. But it cost me $50 for a 20 gallon tank of gas every morning I go hunting. Meat hunters have to pay the same cost every morning and the cost of gas has stopped me several times. In 2008 when gas was $4.50 a gallon it would have cost me between $250 to $300 for gas to go to eastern Montana antelope hunting for 2 days, plus trespass fees, plus meals and lodging. So much for 2008 antelope hunting. Other hunters do it differently but gas is gas. I do not think raising non resident licenses is possible as Idaho did not sell all of there non resident elk and deer licenses this fall (correct me if I am wrong Mark). What is fair? I feel that one should pay for the services rendered. I do notice that most meat hunters have a newer 4 wheel drive and adequate equipment and they are not meat hunters with a $8000 four wheeler in the truck bed. Is it possible to manage “anything” for ALL? Of course not. Everyone has a different opinion. Go to a fish and game meeting which are one specific group and after awhile my stomach gets sick from the bickering. The majority rules with respect to the minority. I did not even go this year. There are a few true meat hunters out there I agree. But a lot of people I talk with are trophy hunters until about 10 am opening morning. I agree with raising the fees to cover the costs, It would mean that folks just like me, would have to save up to purchase the tags & Lic. In essence plan ahead, anything that takes a little effort is appreciated more. A seperate cost for youth tags, which are issued in an unlimited draw, again plan ahead, instead of driving down the road see a deer in a field, go buy a tag and bang.. Your right, with gas prices, etc. Tags and Lic. fees are really not a major part of the picture for residents. With Idaho resident hunting license at roughly $12, deer tag $20, and elk $30; and youth tags half this price, it seems they are well under market. Heck, a resident fishing license is $26. When you consider the cost of a theatre movie at $10 or more, and the examples given above by various posters, it even becomes more absurd. JB, in present day economic terms meat hunting and its place in the North American model in the 21st Century deserves some thought. It does not fit the way it once used to in many states. I suppose the issue is different in every state. To be clear, I don’t object to raising license fees, especially if they are only being raised to a level that puts them in line with comparable recreation activities. However, I worry about moving too far in the other direction; where hunting is only for the wealthy, trophy hunter. I also worry that raising fees could pose a barrier to future recruitment. In such a scenario, dwindling numbers of would pay ever-greater fees in order to keep wildlife management alive. “The majority rules with respect to the minority.” I found this a curious comment given that, in some states, less than 5% of people hunt? It seems to me that–in wildlife management–the minority often dictates policy to the majority. ++I suppose the issue is different in every state. To be clear, I don’t object to raising license fees, especially if they are only being raised to a level that puts them in line with comparable recreation activities. However, I worry about moving too far in the other direction; where hunting is only for the wealthy, trophy hunter. I can not agree with you more and you have my full support with that statement. What worry’s me is the indirect privatization of wildlife on private lands. Russ Miller, Ted Turner’s ranch manager, was quoted in the local paper that they were looking at making money on conservation, this refers to the buffalo. Turner is charging $12,500 for a elk hunt on the flying “D”. Private land is becoming private wildlife. I am Montana centric. Yes, less than 50% of the people even in Montana hunt, but the majority of those that don’t hunt have no or very little interest in wildlife and would not take time to look for a wolf in the Lamar Valley. Then there is a minority that are wildlife watchers and take an interest but there are a small minority. Most people are too interested in facebook or what’s on TV tonight or how to pay the minimum on the credit card. JB, I am sure you meant one of those rich “trophy” hunters who pay huge $$$ to go on guided hunts, not just your lowly old working stiff, who has developed enough patience to hold off pulling the trigger till it’s the one and usually pitches a wallet full of unpunched tags in the garbage about April. My thoughts on your remarks with regards to recruitment and youth. Youth need to understand, hunting is a priveledge not a right, something you work at, earn, plan for, appreciate, if not they won’t last anyway. That’s why I recommended different fee’s for kids, but they need to plan, thus the unlimited draw, this is a privledge. If a youth can afford a 25.00 video game he or she should be able to spend 25 on a tag. We did not sell out NR deer and elk licenses for 2009, though sales did increase sharply at the end of the season. The NR fee increase last year (only NR fees were increased) and wolves were the two factors cited by NR’s in the survey we conducted to understand NR decisions to not return to hunt Idaho last year. Buyer resistance due to higher prices and anger at fee increases for NR’s only are a significant factor. Gaining legislative support for any fee increase is always difficult, but resident fee increase proposals are especially difficult to sell. The Department shares JB’s concern about higher fees discouraging families and youth to begin or continue the hunting tradition. As I said, reliable funding is one of the biggest challenges facing state wildlife management agencies. There are no easy solutions. Mark, per I & JB raise the fees. If it’s not worth sacrificing for its not worth having. Show tickets 7.00, popcorn drinks 15.00 bucks one time, for 90 minute = less than 2$$ a minute… 25.00 for just 8 hrs. with your dad or mom, less than .030 per minute.. opportunity not a right !! — You hit the nail on the head. — It is really great to hear this from a hunter. The chance to harvest game is a true privilege; I wish more hunters recognized it as such. What makes this even more disturbing is the fact that few of MN’s wolves are collared. I have contended for sometime that the number of illegal kills (which I think has been hushed up) in MN is larger than the state is willing to formally acknowledge – and these animals are killed by rural residents with pets (dogs, horses, llamas, etc.) as well as livestock owners (turkeys are a big crop in MN), and hunters. If I could only remember how to spell “Duluth.” Duh! Of all the poaching cases I have ever taken the time to check out, the hunters had licenses and tags. It was either a trophy presented itself at the wrong time, say after dark standing along side the road and human greed took over. Or some other cases were it was openning morning and a few well known poachers watched a herd of elk until after dark and then came back a couple hours before legal shooting hours and started blasting about an hour before legal shooting time started. I think in the older days people might have used the excuse I couldn’t afford a license when they got caught poaching. I believe poaching is alive and well. Yes I hunt for meat, but lets be real here, if you factor in time and money spent, it would be cheaper to go down to walmart and buy your meat. But there are other factors involved that you just can’t put a price on, being up in the mountains, whether with friends or alone, seeing animals you didn’t expect to see, taking your camera and taking pictures. Its funny but sometimes when I go fishing I have more fun setting at the boat ramp watching people trying to back their boats into the water. All those little things you can’t put a price on. I remember as a kid my neighbor every year would load up all his gear and go over to Eastern Oregon for hunting season, heck I don’t think he ever left camp, they just sat around and drank beer and BS’ed the whole time. But whether your a trophy hunter or a meat hunter I beleive they will continue to pay the price, especially if Idaho goes to a points system for the controlled hunts. But at what extent will people start saying thats too much, I have heard people on other forums say because of the damage wolves have done to the ungulates here in Idaho they will no longer pay the nonresident fee’s. How much money does Idaho see from the sales tax on sporting goods items?? Chuck, I have to disagree with you about it being cheaper to go to wal-mart than it is to hunt. For many I’m sure it is but there are still a lot of folks up here that can hunt 10 minutes from the house. I don’t mind paying a little more for tags but if you have children that like to hunt it could get expensive. I would rather pay a little more for a tag than have to eat the crap they call meat at the store that’s for sure. Interesting discussion, but what is missing in the Idaho discussion is POLITICS, not general tax revenue. The Legislature chose to make the wolf licenses cheaper than a meal at McDonald’s and Idaho’s hunters and anglers allowed it! The Governor and the Legislature want to manage wolves without Big Brother from the FWS, but that means Idaho will have to foot the bill for those expensive tracking collars, helicopter time, payroll and now even health expenses associated with helicopter crashes. Do Idaho’s anglers and hunters really want to foot these bills, while the Legislature determines the pittance value of a wolf tag? Also, in case you did not notice it, Idaho F&G does not really manage threatened and endangered wildlife species, the Office of Species Conservation, an arm of the Governor does! So much for Idaho anglers and hunters having an influence on their resources and recreation. And finally, while anglers and hunters belly up to the counter and buy their tags and licenses, who picks the decision makers in IDFG – the Commissioners; the anglers and hunters or the Governor? Anyway, while Idaho anglers and hunters foot the bills except for some non-game checkoff funds and license plates, who really rules the roost? Yes, the IDFG is now footing the bill for wolf management and will continue to do so, as long as the state retains management authority. I don’t know of a survey of the question, but it’s safe say that Idaho hunters and anglers support state management of wolves, with the attendant costs. The IDFG is the state agency responsible for wolf managment decisions, while the species is not listed as a threatened or endangered species. Personnel management is the responsibility of the IDFG Director (Cal Groen) who is hired and serves at the pleasure of the Idaho Fish and Game Commission. Fish and Game Commissioners are appointed by the Governor and confirmed by the Senate. The Fish and Game Commission, and the IDFG, serve the Idaho public through it’s open public process. The Commission meets quarterly in Boise and regularly, in different geographic parts of the state to maintain accessibility to the Idaho public. Each administrative IDFG Region – Panhandle, Clearwater, Southwest, Magic Valley, Southeast, Upper Snake River and Salmon – has a Fish and Game Commissioner who represents that respective Region. The Fish and Game Commission sets fish, game and non-game wildlife management policy, approves state species management plans, approves hunting and fishing regulations and works with the IDFG to set the annuall budget, which must be approved by the Legislature. Mark, do you have #s on how many elk hunters usually harvest each hunting season compared to wolves? I am curious to see what the difference is. In Idaho we are required to send in hunter harvest reports on elk, deer and moose before we can purchase the next years tags. With this system I think IDFG has a pretty good idea of hunter harvest of elk. As far as how many elk the wolves kill, I believe it would be an educated guess at best. 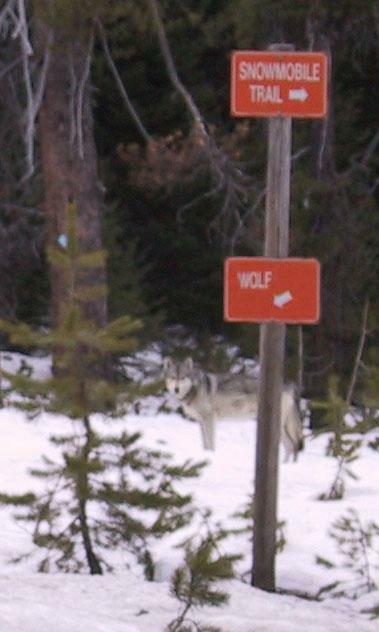 Idaho is so thick and rough in areas that there were wolves in some areas that IDFG did not know about or did not put those wolves on their maps. We (sportsmen) probably should have been more responsible and reported the sightings we had years ago in North Idaho before they were thought by most to be up here. I’m not trying to speak for Mark, I respect him for staying on this blog especially after taking some of the hits he has. If you have never been out and about in Idaho you should come out for a week or so and travel the state from north to south and see for yourself just how big this state is and why maybe our biologists have such a hard time trying to figure out everything that goes on with wolves and their prey. A wolf will eat between 8-23 elk (more in deer equivalent) per year, depending on its habitat, in the November-April time period. They are opportunist pack hunters. They will eat the most vulnerable first – weak, injured, old animals. They, also, however, will eat mature bulls weakend from the rut, calves, and even cows while giving birth. When the easy prey is gone, they will go after the stronger animials, which might otherwise survive winter. They are not always successful in their attacks. By the way, bears are also responsible for eating calves, and there is debate about which species gets more. Recent studies (Dr. Scott Creel at Montana State U, 2008) have shown that fear of predation by wolves affects elk behavior, keeping them at higher elevations and away from more nutritious grazing sources (grasses are better than browse, and it is colder at higher elevations). This, in turn, causes lower animal weights and weakens them more. Low weight births of calves also cause mortality. Wolves will sometimes kill more than they need, leaving a carcass. That irritates elk hunters, notwithstanding the fact that the uneaten remains will be consumed by other forest animals, like coyotes. Wolves also kill coyotes, and have reduced populations by as much as 50% in places like Yellowstone NP. Wolves also make elk more wary, because of the fear of predation, which makes it harder for humans to hunt elk. The human hunter success rate varies by location and whether bulls and/or cows are part of the harvest prescription for the hunting area. But average success is something like 15-20%. It will be interesting if any lowerin of success rates are perceivable when the harvest reports, Cobra mentions, are tallied. Some hunting managemen units are reporting fewer elk in them, possibly because of the elk are killing them. Other causes are also a possiblity, like changing habitat or weather. Mark Gamblin can correct me if I am incorrect on any of this. Wolves continue to expand range throughout the NRM, and notwithstanding the fact of this year’s wolf hunting season, and killing of “problem” wolves by Wildlife Services (in the US Dept. of Agriculture, the population of wolves continues to increase, possibly by as much as 20% or more. The estimates of the net number of live wolves in the NRM will be released later this year. There is a bias in favor of underestimation of wolves as they continue to disperse, and the estimation techniques (including collaring telemetry) is expensive and labor intensive. Other methods of estimation are being tried out. Some hunting management units are reporting fewer elk in them, possibly because of the WOLVES are killing them. Other causes are also a possiblity, like changing habitat or weather. Mark Gamblin can correct me if I am incorrect on any of this. Also, Ralph posted on another thread (Nov 18, http://wolves.wordpress.com/2009/11/18/one-more-trophy-moose-poached-in-montana/) a reference to a wildlife biologist who believed an earlier poster on that thread misrepresented the results of his study on wounding rates by bow hunters (claiming up to 50%, when in fact the statistic is closer to 18%). Read the study for yourself and draw your own conclusion – good paper by this author and an easy read, by the way. If you are interested, here is the cite to Dr. Scott Creel’s study on elk fear of predation. It is a 2009 publication, not 2008 as noted above.